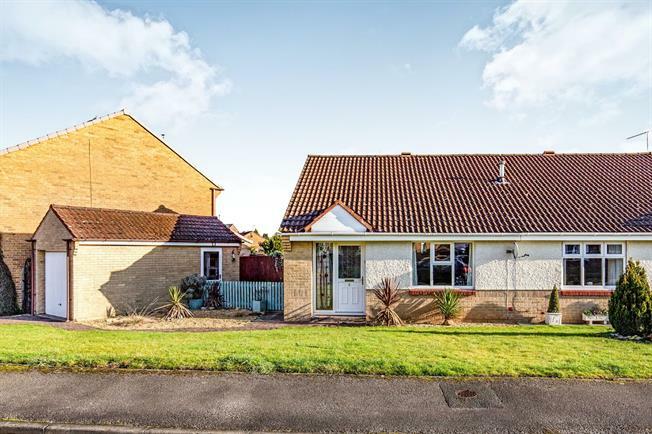 2 Bedroom Semi Detached Bungalow For Sale in Northallerton for Offers in excess of £180,000. Benefitting from wraparound gardens, a driveway and detached garage, in the sought after Romanby area of Northallerton, this immaculately presented two bedroom semi - detached bungalow must be viewed to be fully appreciated. Neutrally decorated throughout with a modern kitchen and bathroom this home is offered for sale with NO CHAIN. We highly recommend viewing at your earliest convenience to avoid disappointment. Briefly comprising of; Entrance hall, kitchen, living room, two bedrooms, bathroom and conservatory, with a detached garage to the side, and gardens to the front, side and rear. Recently renovated, modern white kitchen with a good range of wall base and drawer units, with contrasting roll top counters and one and a half bowl sink with side drainer. Freestanding oven with four ring electric hob and extractor fan. The lounge is light and spacious, fully carpeted with uPVC double glazed windows. The second bedroom with fully carpeted flooring, uPVC double glazed doors opening out into the conservatory. A modern three piece white bathroom suite which comprises, W.C. Pedestal basin, and panelled bath with shower. The master bedroom overlooks the rear garden, with uPVC double glazed windows, fully carpeted flooring. UPVC double glazed windows, with double doors opening out onto the garden. Tiled floor. Detached single garage with up and over door, electricity points and lighting, with side access door. The property boasts wrap around well maintained gardens to the front and side, and a driveway with single garage for parking. The rear of the property also enjoys a well maintained rear garden mostly laid to lawn.